Tis’ the season to celebrate the holidays, spend time with family and friends, and find joy in the beauty of the Pacific Northwest winter. 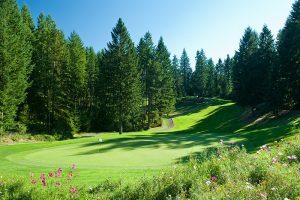 At Gold Mountain Golf Club, we’re keeping the golf course, restaurant, and Golf Shop ready for our guests to enjoy all of the season’s offerings. When it comes to gift giving, the Golf Shop is stocked with quality gear and clothing that will definitely bring joy to any golfer! 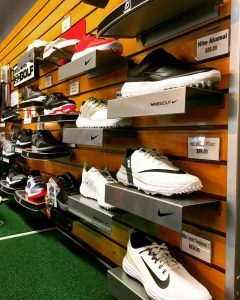 Many items are even on sale right now with golf bags 20% off, Nike clothing and shoes 25% off, and University of Washington and Washington State University accessories 20% off. Another great gift for the golfer in your life who likes to walk the course is a new Clickgear cart with a cart seat and cart mitt as perfect add-ons. All you need to do is choose from all the great colors we have available! Golf balls make great quick gifts for a distant relative, school teacher, or even an employee this holiday season. We have everything from Titleist and Callaway, to the Volvik extreme colored golf balls. Looking for something that is perfect for the golf course or a casual night out? We have hundreds of quality and fashionable layering jackets and pullovers available for both men and women, perfect for anyone on your list. Maybe you know someone that has been eyeing that special sand wedge all year? In that case, gift certificates are a great way to help them get a personal fitting and order their dream club. You can even order gift certificates online and have them mailed directly to you! What many people don’t realize is that Gold Mountain Golf Club has countless items that a non-golfer would love too! Rain jackets and hats are great gifts for family that take walks year-round. Warm layering jackets and pullovers, beanies, and accessories are all ideal for off-course fun as well. Come visit us at Gold Mountain Golf Club or shop online for all of your holiday needs this year. It is hard to believe that we have already raced into the month of August, considering how long it took the weather to make it to spring! Our guests and members have made it a priority to get in as much golf as possible to make up for the lost time earlier in the year. Tee times will continue to be available to book 30 days in advance, so take advantage of the best golfing conditions in the Northwest and book your tee time online now. Book your tee time directly on the website! 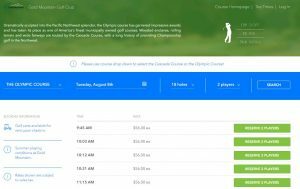 We have seen tremendous results with our online booking engine and automatic green fee discounts at check-in, and we will continue that practice throughout August. 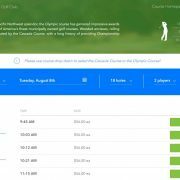 When you reserve your tee time online, you can see exactly what we see in the Golf Shop, showing our guests tournaments, large groups, and how busy the course is in general. This function helps our golfers decide the best possible tee time and day to play to fit their schedule. As we move from the long days of summer to the crisper mornings of the early fall, keep a look out for our group specials on our website. Foursome fun on the Olympic Course. These specials have been enormously popular and we look forward to making them available to everyone again this year! With the start of fall comes our annual Dave Williams Best Ball Tournament, Saturday, September 30 and Sunday, October 1. This is one of the most enjoyable tournaments of the year and signup sheets will be available in the Golf Shop beginning this month. Following the first round we will have College Football playing on our large projector so that our tournament players can cheer on their alma mater as they enjoy our complimentary post-round meal. On Sunday, as everyone is watching the scoreboard to see who places in the money, our large screen projector will be displaying NFL Football (usually the Seahawks)! And for those wishing to see how the PGA Tour is finishing up, our flat screens in the bar will be showing the 2017 Presidents Cup. Finally, I would like to share exciting news as Gold Mountain will be hosting the Mountain West Conference Championship next April! We are beginning the process of gathering tournament volunteers and captains for this fun event, so please keep your eye out for signup sheets or swing by the Golf Shop to inquire with myself or our General Manager, Daryl Matheny. We would love to hear from you and get you on our team! We can’t wait to see you at the course for the final stretch of summer! All of us at Gold Mountain Golf Club want to thank you for coming out this year and making 2017 a great success after what can modestly be described as the most challenging winter and spring for golf. https://goldmountaingolf.com/wp-content/uploads/2017/08/Tee-Sheet.jpg 751 1193 teesnapdev https://goldmountaingolf.com/wp-content/uploads/2017/04/goldmt-logo_2Color_transparent-1-e1493064764505.png teesnapdev2017-08-08 12:06:042017-08-08 12:06:04Can it Really Be August Already? For most people August marks the end of the summer and the start of the school year, which means you may be thinking your fun summer activities are coming to an end. But why not keep golf going as one of the top activities on your list? Whether you are just playing for fun, hitting the course with your family, or looking to improve your game, golf is something that can be enjoyable for everyone! With tournaments, leagues, clinics, and demo days, there are many opportunities to fit golf into your busy summer and fall plans. Planning is always an important part of any activity and as the merchandiser and buyer for Gold Mountain, let me help you get ready for the season. Essentials for the complete golf bag: a driver, fairway wood, hybrid, irons, wedges, putter, golf balls, tees, and a glove. If you notice you are missing anything on that list, well you know where to find it…the Gold Mountain Golf Shop! 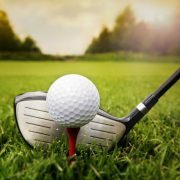 With the brutal winter we had, you may be looking to brush up on your golf game a little, there are group clinics or private lessons you can start off with to help you feel ready to hit the links. If you are wanting to really kick it up a notch with your game take a look at our membership opportunities, and the amazing benefits that come along with being a member. 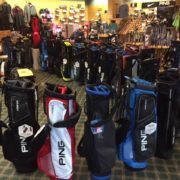 Outside of the basic necessities to fit your golf game, regardless of your skill level, we have some fun items in our Golf Shop to really enhance your experience on the course. Try out the new soft feel or colored golf balls to help keep your eye on the ball. Or upgrade to our golf bags that have a cooler pocket to keep your snacks and drinks fresh throughout your round. And looking the part is always half the battle, so make sure to check out the latest gear all the top players are wearing each week. We loved seeing everyone on the course all summer long and can’t wait to keep the moment going into the fall. It has been a beautiful summer in Kitsap County and Gold Mountain has flourished along with it. 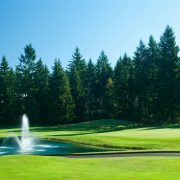 Both the Cascade and Olympic courses are currently in great playing shape and there has never been a better time to come out and play some golf! Interested in coming out to play? 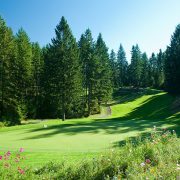 Visit www.goldmountaingolf.com and book your tee time online, any day in July, and receive the following discounts on your green fee(s)! As we roll into the latter half of summer, Gold Mountain will continue to bustle with various events. We will be having multiple fitting days with the biggest brands in golf such as Srixon, Cleveland, Titleist, TaylorMade, and PING. Interested in trying some of the newest equipment in preparation for a new purchase? Make sure to call the Golf Shop at 360.415.5432 for more information on dates and to reserve your spot at the fittings. Don’t forget our second annual Red, White and Blue Golf Tournament will be held on Friday, November 10, with a 10am shotgun. Last year’s inaugural event was a big hit and benefits a great cause by supporting our military through the VFW Unmet Needs Program. If you are interested, please contact Chris Keough at 360.434.8658 or at chriskeough@windermere.com. That’s it for now, we will see you on the links! 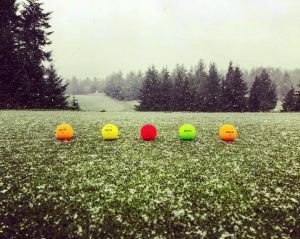 Spring has sprung at Gold Mountain Golf Club, even if the weather is a little late to the game. We are full steam ahead for our busy months and have full confidence that the rain is behind us and sunny days are to come! 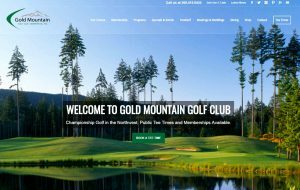 In the anticipation of spring, Gold Mountain has undergone a bit of a face lift. The clubhouse and Olympic room look incredible and feel brand new having just received a fresh coat of stain! The improvements aren’t just inside the building, we are currently in the process of updating out Grand Patio! Our new items are not in quite yet but keep your eyes peeled for beautiful new patio furniture. Couple with the beautiful blossoming flowers around the property, Gold Mountain is a sight to be seen. The golf course has also seen a notable change on our Cascade Course! The par four fifth hole has been transformed into a par five and continues to be the hardest hole on the course. Our maintenance staff has done a fabulous job with the transition and continue to uphold the quality of our golf courses each day. We have also seen a change in our technology world at Gold Mountain. We are very excited to introduce our new website, and along with that an entire new point of sale system. the course, and they are guaranteed the lowest rates available! With this new technology, we now have the capability to check guests in outside of the Golf Shop, so not more waiting in lines trying to get to your tee time. Once you check-in once the system retains your information and your preferences in our system, this makes your return visits to Gold Mountain easier each time. The system even extends to our snack shop and beverage carts! We want to continuously improve your experience at Gold Mountain and everything we do is for the enjoyment and ease of our guests. 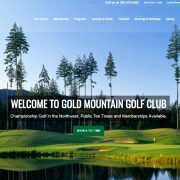 Our goal is to make Gold Mountain Golf Club your number one golf destination! 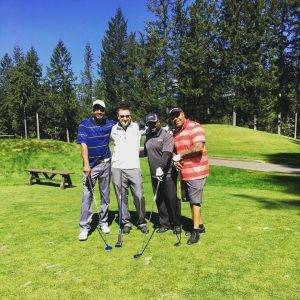 Make a tee time online or call the restaurant at 360.415.6895 to make a reservation today. When it comes to deciding a grab-n-go menu for our golfers we strive to make the hot and cold products readily available at your fingertips. The placement of the snacks, soda, Gatorade, and water, is easily accessible in the pro shop during registration, or at a nearby entry or exit to the golf course. 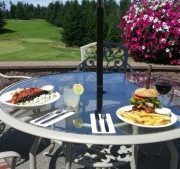 Hot items ordered in the restaurant at the turn, such as a huge Chef Jon burger, will take no longer than 8-12 minutes for our golfer’s in-between their nine holes so they do not lose their place on the course. On course, we provide beverage carts and two full-service concession shops to cater to your needs during a round. Join us before or after in the restaurant and have a delicious breakfast, lunch, or dinner, and enjoy one of our drinks designed with golfers in mind. We take great pride in being able to customize any menu to fit your specific event requirements whether you have a group of 30 guests or 300. A big highlight to all events at Gold Mountain is our big screen TV that is always showing local and national sporting events. 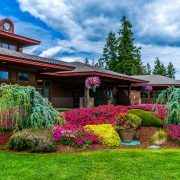 When you visit us for golf retreats, weddings or corporate meetings, please take advantage of our outstanding views of the Olympic Mountains and the beautiful Pacific Northwest scenery. We will be hiring food and beverage employees for our upcoming 2017-2018 season in March. Join our exciting team today! 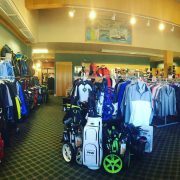 The Golf Shop at Gold Mountain Golf Course is ready for the season ahead. Not just the golfing season, but also the holiday season. If you’re searching for special gifts for family and friends, Gold Mountain is a great place to treasure hunt! My name is Suzanne Mehlert, and I’m the new buyer for the Golf Shop. I’ve been a buyer and visual merchandiser for over 30 years, but I look at every season as a new and exciting landscape of products and trends. That’s me in the picture with over 50 mannequins, as I searched the PGA Golf Show and Fashion Market in Las Vegas this fall, looking for the new trends, new designs and latest technology, while comparing prices and quality, in order to bring home the best values I could find for our guests. Right now, collegiate gear is ready to wear and give this Christmas. Whether you’re a Husky or a Cougar, we’ve got you covered. We’ve got you covered, whether you’re a Husky or a Cougar. You’ll find new Adidas, Under Armour, Puma and PING apparel, which look as great off the course, as on. Another great gift idea is our quality Cutter & Buck Seahawks apparel for men & women. Dreaming of a new Titleist wedge or Odyssey putter with a Super Stroke grip? Dreaming of a new wedge or putter? Check out all the latest gear at the Golf Shop. Whatever your golf gear wishes are… there are treasures to be found at the Gold Mountain Golf Shop!